When I was 10, my uncle was living with us and was studying to become a bartender. I used to help him memorize cocktail ingredients using flashcards and the names captured my imagination: Tequila Sunrise, Zombie, Hurricane, White Russian. To a 10-year old it all sounded so exotic. At 13, my mom taught me how to make a bloody mary – complete with horseradish, Worcestershire and celery salt. As a twenty-something watching old movies from the 1930’s, I thought it was so cool and elegant when a guest arrived and someone offered to make them a drink. 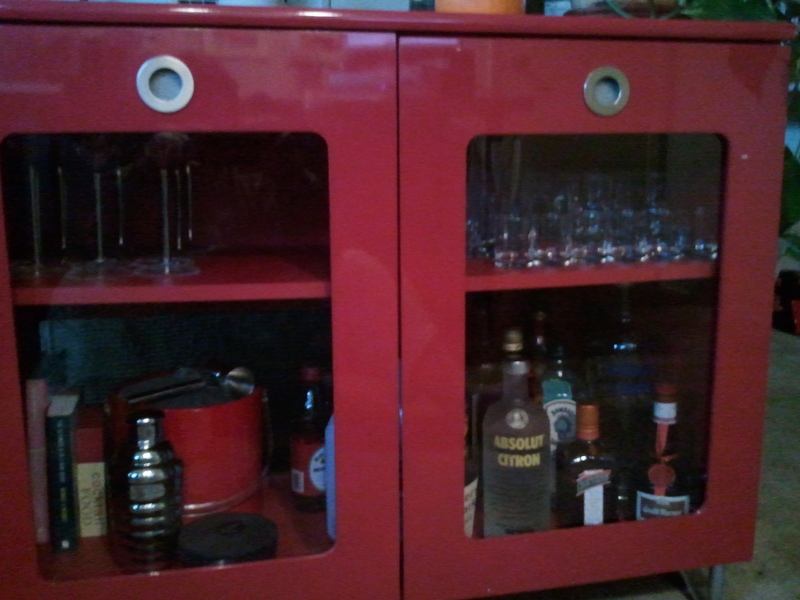 So my dream of finally having my own bar was realized, (and inspired by a recent Mad Men marathon.) I re-purposed my old red lacquer television stand and purchased shot glasses, Highballs and Double Old-Fashioned glassware. (I’ve yet to find the perfect Martini glasses.) I moved the champagne flutes out of the wine cupboard and stored those in the bar as well. Mixers – Tonic water, club soda, ginger ale, V8, cranberry juice and assorted fruit sodas, Rose’s Lime Juice, grenadine and vermouth – sweet and dry, Campari and Angostura bitters. And then I wanted to make every cocktail known to man, but knowing that I only recently regained my tolerance for liquor I smartly decided not to try the whiskey sour, gin fizz, cosmopolitan and Manhattan all in one afternoon. Shortly after I had stocked the bar to (almost) capacity, Joel stopped by with a friend of ours. “Umm, you’re not exactly a big drinker are you?”, Tim asked. “She’s been watching Mad Men,” Joel muttered, as if this explained everything. (Actually is mostly does.) So I offered them a drink. They declined, but I love the fact that I could whip up any cocktail at a moments notice. How civil, cultured and classy of me! we don’t need to go to the bar just to heathers house. i have the same glasses on mad men [love the show too i used to work with one of the owners of BBD@O add agency when i was at the newspaper] found my glasses at thrift store .you are so grown up love you so happy you are writing again!